This is the finished color sketch for the print and the actual print is in full vibrant color with a white border and Title, number and artist signature in the bottom margin. In “Leap of Faith”, by Daniel A. Moore, Alabama’s award winning Jonathan Allen flies over Texas A&M’s blocking back, Trayveon Williams, to sack Trevor Knight, A&M’s QB. 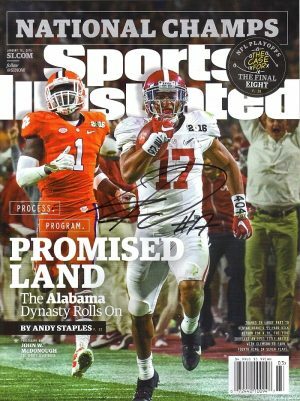 Other Alabama defensive standouts, Tim Williams, Reuben Foster and Ryan Anderson, will also be commemorated in the background of the painting. Since 1979 No one has captured the excitement of Alabama football like legendary sports artist Daniel A. Moore. 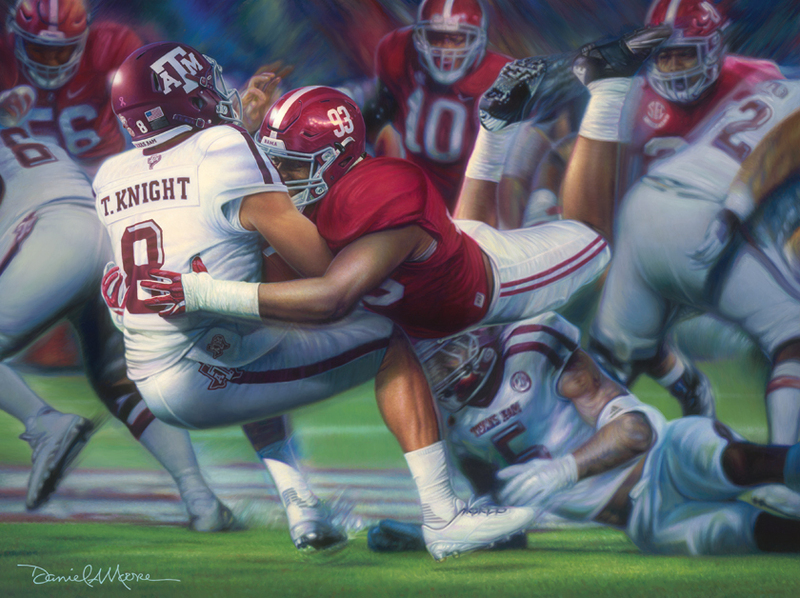 Leap of Faith is Moore’s tribute in oils to Jonathan Allen’s gravity defying leap to sack Texas A&M quarterback Trevor Knight at Bryant-Denny Stadium. This exquisite masterwork commemorates a great moment in the game and is being offered as Limited Edition Fine Art Prints and Canvases. Each heirloom quality product is meticulously reproduced from a traditional oil painting, unlike some computer-generated images offered by other publishers. •Regular Edition Lithograph – The Regular Edition is the most widely produced edition. These prints are produced by a 4-color process known as offset-lithography. This “mass-production” process utilizes small red, green, blue and black dots to approximate the colors of the original artwork. Additional single color touch plates may be added to the printing to enhance colors closer to those of the original painting. Our lithographs are printed on acid-free archival paper, using permanent inks. Each Regular Edition Lithograph has an image area of approximately 19½” x 26” and is hand-signed and numbered in pencil by the artist in the lower margin of the print. Each Regular Edition Lithograph is accompanied by a Certificate of Limited Edition & 1 gold embossed seal. Artist Proof, Collectors and Museum editions available as well. We offer framing too, just contact us with any questions.